Writing a novel is a big endeavor. Authors must put their heart and soul into paper to tell a story and it’s a shame to see how sometimes the book’s cover is totally unrelated to the storyline. This could be due to lack of communication between the designer in charge of synthesising an entire romance novel into a single image, or to the lack of expertise of the person in charge of making the cover design – sometimes the author itself. Self publishing authors are often looking for online tools to handle every step of the process by themselves, which is admirable! Luckily, Placeit recently came up with a book cover maker that makes their jobs way easier. With a wide variety of book cover templates to choose from, authors can now simply customize these with their own info and personal style to generate an eye-catching book cover that conveys both professionalism and the true meaning of the book. Not all romantic novels are the same, therefore, they don’t need to look the same either. Our romantic cover template allows you to fully customize each template to make it unique and truly reflective of the story. 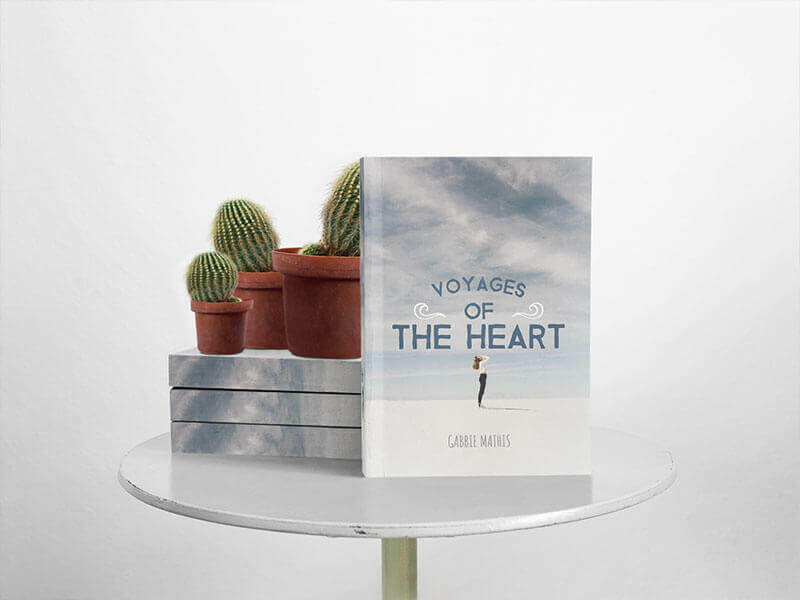 Take Voyages of the Heart as an example. This is a novel about a woman who rediscovers herself while going through a divorce. Instead of going for an abstract pattern or design (which would do great for other novels or styles!) I decided to choose a photograph featuring a young woman by herself in a white and blue scenario that transmits calm and solitude, which is what the book is all about. Exploring these kinds of interpretations is one of the advantages of using a book cover maker like Placeit’s because you don’t have to rely on anyone else’s interpretation of your book, you can take full control over what image will represent the characters and the situations they go through. It’s hard to believe this beautiful book cover was made online and in just a couple of minutes, but it was! 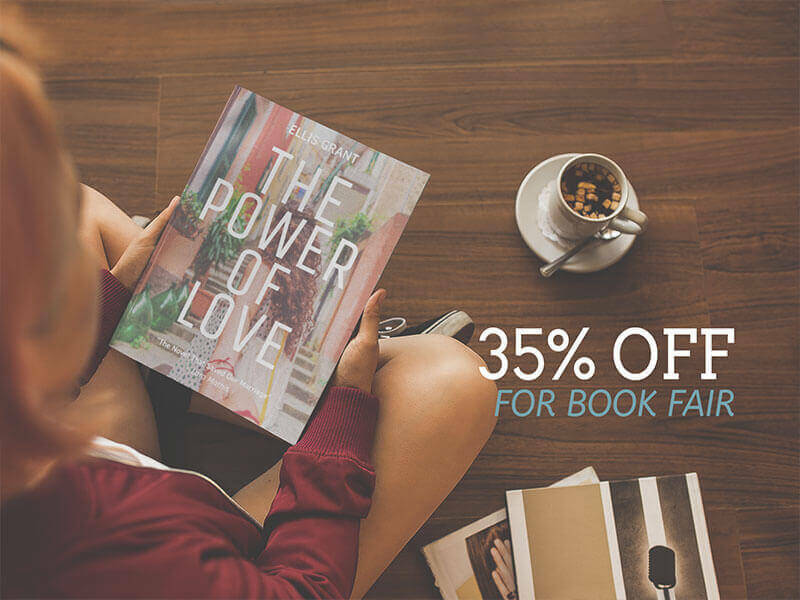 Find the perfect romantic book cover template to go with your love story. 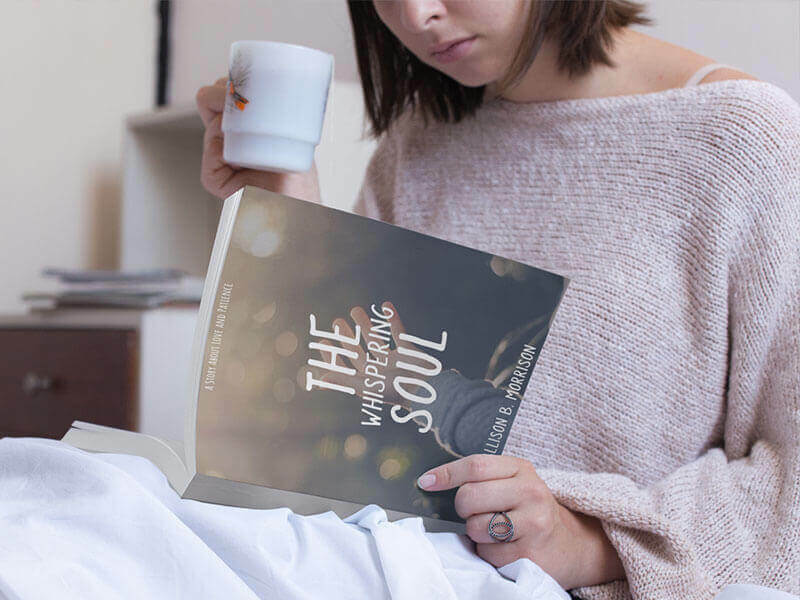 Also, since this novel is aimed towards a younger crowd, mostly women in their twenties or thirties, a book cover mockup featuring a young woman drinking coffee in bed makes it the perfect setting in which you can display it to flaunt your cover design. 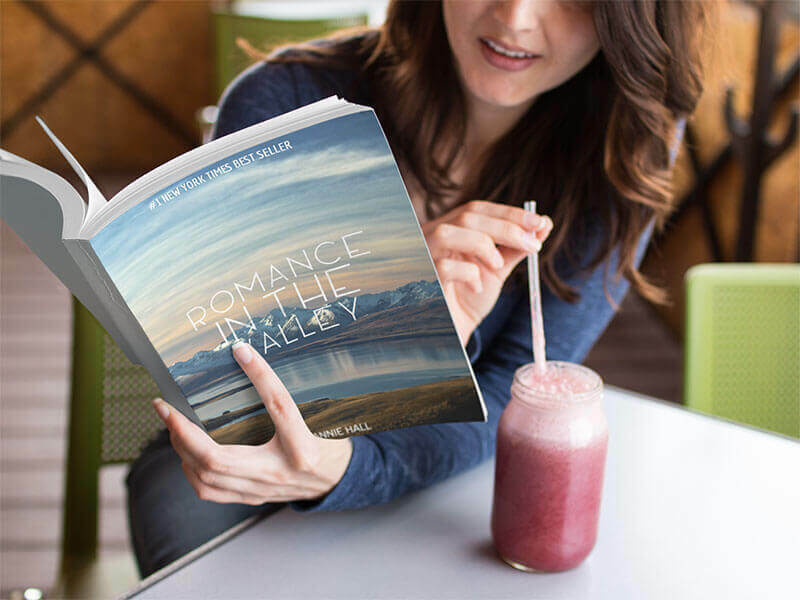 All great romance novels deserve covers that live up to the story, like this one for Romance in the Valley, a #1 New York Times Best Seller with a striking cover! 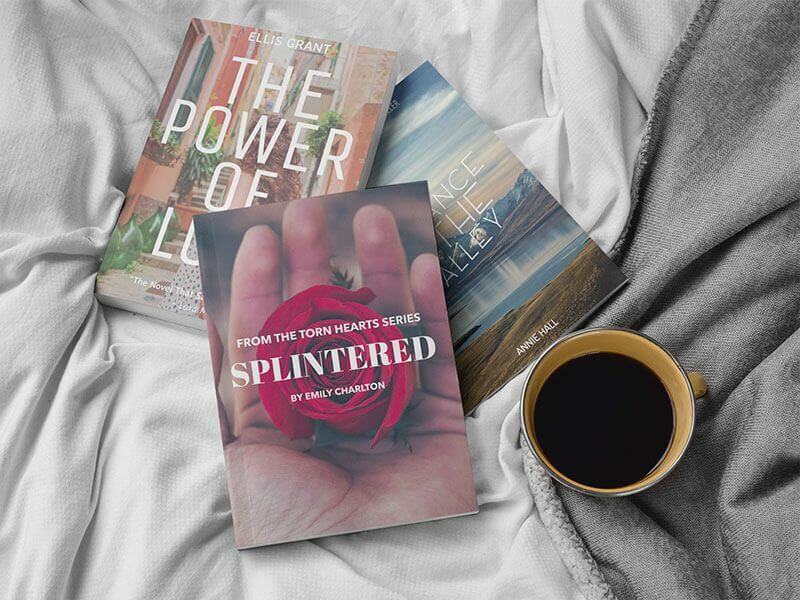 As you can see, book covers can sometimes feature photographs as a part of the design, don’t just stick to boring patterns or flat designs, incorporating an eye-catching photo into your book cover can help convey a message about the story itself while also resulting in an attractive cover design your readers will like to flaunt on their bedside tables. If you are planning on writing a romantic novel that will speak to a specific audience, you will want its book cover to also be attractive to them. 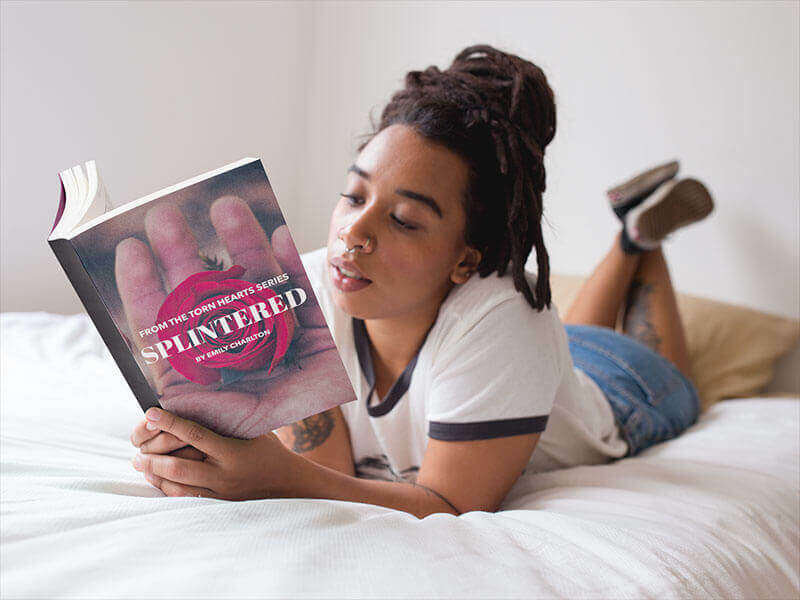 Splintered is a teen romance, so it only makes sense to use graphics and design elements that will get the attention of that segment. I won’t want to use traditional typefaces and a photo of a couple holding hands in the beach because teens may find that cheesy or lame, I’d rather go for a provocative image like a red rose, which transmits a more powerful and passionate message. You won’t want to compromise the story by designing a book cover that sells but has nothing to do with what the novel is all about, but think about finding a balance to captivate the attention of potential readers from the first sight. Facebook ads are a great marketing tool you can use to promote your latest novel, get more downloads and purchases. Once you have a cover ready for your romantic book, go ahead and create beautiful Facebook ads to promote them, like the one above. All you need to do is upload your image file for the cover to the book mockup and add some text to go with it. In this case I decided to make a promo for the upcoming book fair. It’s the perfect way to attract new readers and encourage them to pick up your latest book . If you want to learn more about book publishing tips and best practices, we recommend visiting the Book Publishing category on the blog for more content to make the most of your book. I especially recommend the Complete Guide to Self-Publish eBooks, which will tell you all you need to know about self-publishing your first ebook. "I changed the cover on my book for a new one I just designed and sales are finally rising! Just in time for holiday season, all thanks to Placeit"
Easily create the book cover you were longing for. Try the one and only online book cover maker that self-publishing authors find easy to use! No software to download, no graphic design skills needed. Are you an indie author looking for a site to print and distribute your latest book? Well, we've rounded up the best print on demand book sites, as well as some handy tips for selling more! Make a book cover now using Placeit's Recipe Book Cover Maker. Create the cover you've always wanted without buying expensive software or hiring a designer. Create amazing fantasy book covers from your web browser with our fully customizable cover templates. Get the file instantly, no photoshop needed! Design a book cover in just seconds with this amazing online 3D book cover maker! Get Photoshop-free realistic ebook covers to promote your latest book now.